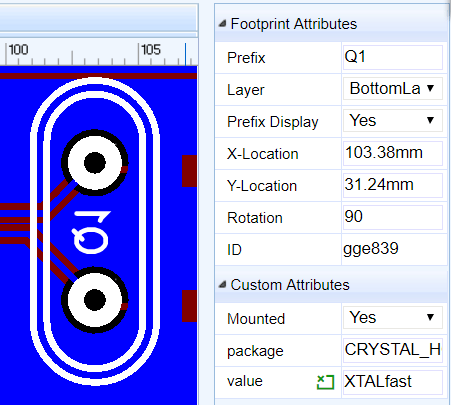 When selecting a Footprint, you can find its attributes at the right hand Properties panel. Prefix: It is same as the schematic. If you move the prefix too far away from the package, it will be draged back to the footprint when you open the PCB again, if you don’t need the prefix please set the prefix display as No. Layer: You can set a footrpint to be on the TopLayer or BottomLayer. Note: The footprint mirrors when swapping layers. X-Location and Y-Location: Moves the origin of the footprint to a precise position. Rotation: Rotates the footprint about its origin over the range from 0o to any angle in 1o steps (visually of course multiples of 360o will appear identical). ID: EasyEDA will assign a unique ID for each footprint automatically, you can’t modify it. Sometimes, we need to change some attributes of multiple objects together, such as the track width, hole size and font size. Now, you can select them and do some changes. Taking the track for an example. 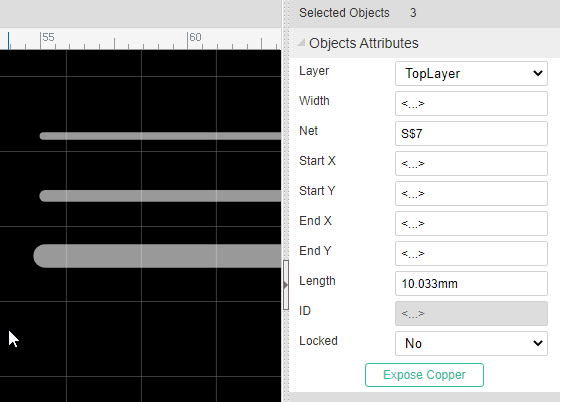 If you select 3 tracks, now you can change their Width, Layer, Net together. You could also use it with other items such as Pad, Via, and TEXT.